It is almost time for back to school and that, for us bullet journal lovers, means that it is time to set up the bullet journal for the new school year. This is exactly what I am going to talk about (or write about?) in this blog post. I want you to be fully ready for school and have your bullet journal ready and set up. There are many ways in which you can set up a bullet journal for the new school year. In this blog post I am not going to talk about setting up a whole study bullet journal. I am only going to cover how to set up your personal bullet journal so it is also ready for school. Because of that, all of your pages and collections that you use now can safely stay in your journal. Continue using them if they are helpful, just do some tweak here and there for school. Okay, so now that we are on the same page, let’s just dive into the ‘how’. A timetable is something, you are definitely going to need for the school year. Don’t forget to add all of your classes, extracurriculars, if you are participating in sports, hobbies, everything you do at a set time every week. This way you get a good picture of how your week is going to look like and see when you have free time for yourself. Color code your subjects and note your color code system on the margin. Create a page for your grades, so you can easily see, how well you are doing in your subjects. It makes it easier for you to keep track and can even motivate you to work harder. If you want to, you can even combine this page with your exams date page, that you find under ‘Pages that you might already have and you only have to tweak them’. It is so easy to not sleep enough, when you have to do so many things for school. But you know how important sleep is, so try to go to sleep at the same time every day. In your sleep log, track the hours you sleep so you can easily see, when you are not sleeping enough. Maybe even set a goal for yourself, for example 7 hours of sleep every day. A time log is very handy to record the time you actually spent studying. Maybe you have the feeling, that you are always studying but your grades are not getting better. Or you think that you are not studying enough. A time log is going to tell you how many hours you were actually studying, so you don’t have to guess anymore. If you don’t like your grades, increase the time you are studying. Only record the time you were studying at home, not that in school. You can also see, what subjects you study the most for and what subjects you should study more. This way you can easily find a balance. These pages are going to help you through hard times. If you feel burnt out or unmotivated, you can flip to these pages. You can use Pinterest to find a lot of ideas for both of these pages. Don’t forget to refer back to the self-care ideas at least once a week and use one of the ideas, so you have a little me time. You can also use your affirmations page every morning before school or even when you get home and want to start working on homework. Just make sure that you choose self-care ideas and affirmations that suit you. Do you know the Level 10 life pages all over the bujo community? You can use the same idea for your subjects. Rate a subject from 1-10 depending on what you think how well you are doing in that subject. Do this maybe 1-2 weeks into school, if you have a lot of new classes, that you can’t rate now. After that, write down objectives on how to raise that number to 10. You can note study methods, the hours you want to spend on that subject every day, maybe you want to find a study group for a subject, etc. When you are studying, you can follow these steps, to make you even more effective. So just add your study or school goals to your goals page next month. It is very important that you set out goals for yourself, so you know, what you want to achieve. Set realistic goals and only set a few. You can always have more if you did great on the previous goals. You can set yourself monthly goals or weekly goals, whatever you like more. IF you want, you can even have both. So possible goals could be a grade on a test, studying every day, a set amount of time spent studying, a set amount of chapters, etc. You can use your future log, your calendex or your year at a glance for this, whichever you have. If you happen to don’t have any of those or something similar, you can also just set up a spread only for your exam dates and assignments due dates. 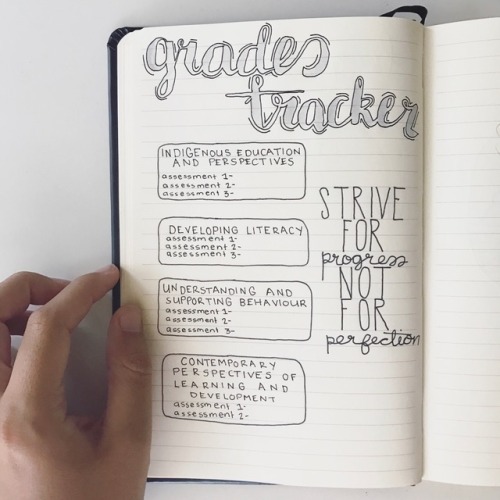 If you do so, you can also include your grades in this spread. Whatever solution you choose, it is really important to note the dates of your exams and assignment due dates somewhere you will find them. Most of the time, we have to many things in our habit trackers. That is fine, if you are on summer holiday and have basically nothing to do the whole day. But once school is back, you are going to have lot less free time (sorry, to break this to you). So try to reduce your habit tracker, take out things that are not important, so you don’t have that much of a pressure on yourself. If you want to maintain studying every single day, add it to your tracker to motivate you. You could also create a separate tracker with your subjects only, and cross of the days you were studying for each subject. If you don’t have a workout plan yet, set it up now. I am not going to get into why you should work out and that you definitely should, but know, that it is very important, especially in stressful times. Working out will help you with school, you are going to concentrate better and have more energy. So first, you should set times when you want to work out each week. For this, look into your timetable (that you previously set up) and identify busy days. Those are the days where you don’t have the time or the energy to work out. Find shorter days. Also try to schedule your workouts at the beginning of the week, for example Mondays and Wednesdays. Those are the days where you still have some energy. You can also schedule a workout for the weekend, if you want to. Decide on the type of workout you are going to do. It could be yoga, going to the gym and doing weights, cardio, dancing, whatever floats your boat. Try to schedule at least 2×30 minutes per week. Don’t spend too much time on your bullet journal. Don’t forget, it doesn’t have to be super pretty, it just has to be helpful. So make it simple! Also, set up everything before school starts, so you already have everything you need. Adding some pages is a lot quicker if you need to, than setting up the whole thing while school already started! I hope this blog post helped you setting up your bullet journal for back to school. If it did, share it with your friends on or social media, so others can see it, too! If you want to buy cute notebooks for back to school, check out Notebook Therapy! They have a lot of cute ones and they are high quality, perfect for a study bullet journal 🙂 You can use my code ‘thegoldennabla10’ to get 10% off and save a little cash for other school supplies! Thank you for reading and let me know in the comments if you are excited for back to school! I know I am!